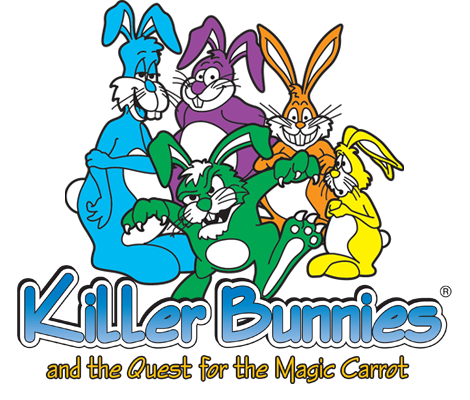 Killer Bunnies and the Quest for the Magic Carrot is a fast paced, action filled card game, in which you must try to keep as many Bunnies alive as possible, while eliminating your opponents’ Bunnies. The problem: Your opponents are armed with weapons and will stop at nothing to keep you from winning the game, which can get dreadfully vengeful, horribly nasty, hilariously messy, and just plain fun. Can you keep from being attacked by the whimsical Whisk or the torching Flame Thrower? Defend your Bunnies with the Magic Spatula, or use a Feed The Bunny card to starve out an opponent.It’s off-the-wall strategic fun, where the goal is to survive and claim the Magic Carrot to win the game.